That all being said, I got the opportunity to see the debut of a new kid in town. 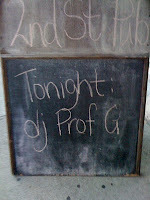 DJ Prof G unleashed his first set at the 2nd Street Pub from 8:30 to after 10 or so last night to an extremely well received audience. The set consisted of the perfect amount of variety to appease the diverse crowd with acts ranging from John Legend to Deee-Lite to Beck and everything inbetween. He wasn't afraid of trying artists the crowd may not be familiar with either so there was some Trombone Shorty, Zapp and Rodger, Funky Meters and other groups to level the playing field. One of the things that made this foray successful was that he wasn't afraid to change the flow of his playlist to take it in a different direction when he needed too. The variety of artists and lack of throbbing beats was important as it laid down a framework for chilling out and hanging with your friends, which is what the atmosphere of the venue is tailored toward. With additional exposure and practice, I think he can make a helluva go at it in this area and make a name for himself. If you get the opportunity when you are around, check out a live show and hit up the DJ. You never know if it's their first time doin it and doin it and doin it well. ahhhhhhh!!!!! totally surprised to read this!!! thanks for the mad props again!!!!!!! Niceness. Big Up PROF G.